Berries are one of the most accessible fruits during the summer time. This refreshing tart allows you to incorporate your favorite berries into the recipe, whether it's strawberries, blueberries, blackberries, or any other combination. 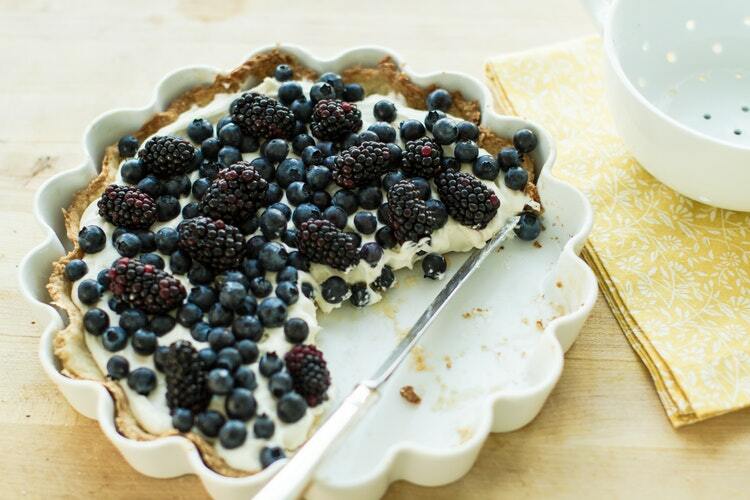 Skip the pie from the grocery store and opt for the more natural ingredients of this tart! Make the crust: Preheat oven to 350F. Pulse oats, flour, coconut oil, agave, salt, and cinnamon in a food processor until oats are coarsely ground and mixture resembles wet sand. Press crust mixture into the bottom and up the sides of a 9-inch tart pan. Bake until crust is golden brown, 20-25 minutes. Transfer to a wire rack and let cool. Make filling: Rinse and drain the soaked cashews and place them in the bowl of a food processor or high speed blender. Add ground chia, maple syrup, lemon juice, turmeric and salt. Blend on low then increase to high gradually adding water. Blend for 3 minutes until very smooth, scraping down sides of bowl as needed. Add the melted coconut oil and blend, just briefly, to combine. Pour the filling into cooled crust. Top with fresh berries and refrigerate until firm, about 4 hours. Serve and enjoy!